I have had my Sunbeam Iron for about 6 or 7 years. 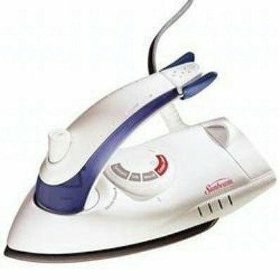 It is a basic iron with just a few key features that make it work for me. It was not very expensive when I bought it, probably about $25.00. I think Sunbeam seems to be the main brand for your average iron. I did not want to pay a lot for an iron at the time, since I had broken my last one by dropping it on the laundry room floor one too many times. I was looking for a cord that swiveled out of the way to some extent and for steam. This iron had both those features plus a few more. I have been happy with it for the most part. It is easy to fill from the faucet because the front cap just flips up and you can see the fill line easily so it is no problem to fill it - as long as you use a small stream of water. I think the spray feature got clogged awhile back. That is probably due to our hard water, we get a residue on many of our water using appliances (coffee maker, water dispenser etc.) so, most likely I could clear that off and it would be back to normal. I do not blame that on the iron at all. I like the shot of steam - it is very important to getting wrinkles out of fabrics - particularly some that are creased from packaging like curtains or bedding. One of the best features of this iron is something I didn’t know I needed: the auto shut off. It turns the iron off after about half an hour, if you haven’t used it. That really gives some piece of mind, when you’ve left the house and can’t remember if you have unplugged it! I also like the heat setting - you slide the lever up according to what type of fabric you are working with. This iron is a good one for most house hold uses.